Prospective homeowners have a lot to think about before buying a home. Interest rates, the risk of owning an illiquid asset, and the future state of the housing market are all difficult questions that need to be answered before making a life-changing decision. One of the considerations potential homeowners must make is the cost of maintaining their home. When renting, the owner of the building or condo would take on the costs of broken appliances, stained carpets or other damage. But when the building becomes yours, the responsibility shifts, and any and all unforeseen costs must be covered by the homeowner. In a study performed in December 2013, Choice Home Warranty asked 2000 24-35 year olds, a large first-time home buying audience, how much they would expect to pay in home maintenance costs on an average home. The respondents, surprisingly, underestimated the average cost by more than 27%. Choice asked young adults how much they would expect to pay in home maintenance costs per year on an $300,000 home of average age. They responded with a mean number of $2191.1, over 40% lower than the expected minimum $3000 home maintenance cost experts suggest accounting for when buying a home of this price. 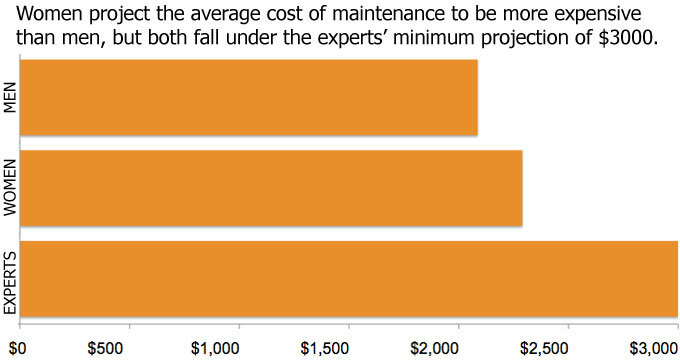 Home maintenance experts suggest homeowners plan for home repairs from one to four percent of the home cost per year. For the house suggested to our study group, that number would be $3000 to $12000 in costs annually, a price that would likely only go up as the home aged. The differential shows that most first-time home buyers will go into the real estate transaction not truly understanding the future costs of their home. Many will see the cost of the mortgage as their only large cost, without properly budgeting for unforeseen events that come from appliances breaking or the home getting damaged unexpectedly. Women appear to be better prognosticators of actual home maintenance costs, as they estimated the average expenses per year to be $2290, $204 higher than the average reported by males, $2086. Salary also seemed to have an impact on responses, with 1115 respondents in the $25,000-$49,999 wage bracket expecting a $2128 average cost, compared to $X for other salary ranges. 150 responders in the $0-24,999 bracket expected a $2275 yearly expense, but their representation in the group as a whole is not statistically significant. This study shows that many prospective homeowners may be putting themselves in line for financial troubles in the future, if they purchase a home while incorrectly assuming the actual costs of ownership. Those that do proper research and a buy a home that sits realistically within their budget will likely avoid the stresses that come with budgeting issues. The Choice Home Warranty survey asked respondents aged 25-34 “On an average-aged $300,000 home that you own, how much would you expect to pay in home maintenance costs per year?” using the Google Consumer Surveys tool. The survey ran December 3rd to December 6th, 2013. Results are weighted by inferred gender, age and geography to reflect the population.